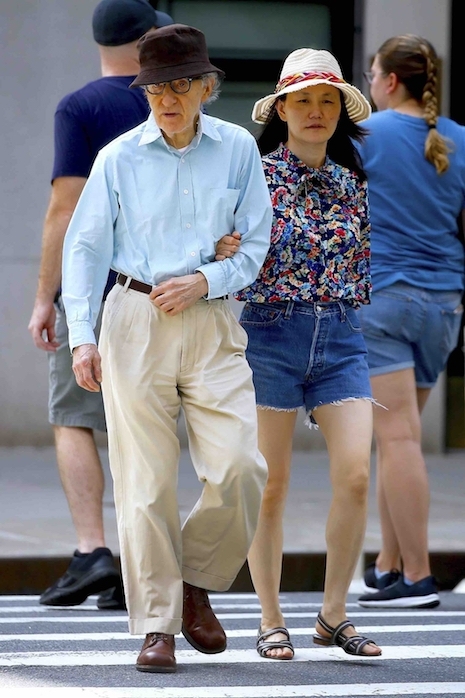 Woody Allen, 82, is walking in New York with his wife Soon-Yi and he has a lot to ponder. Everyone is perplexed about his film A Rainy Day in New York. Inspired by #MeToo, the film’s stars Timothee Chalamet, Selena Gomez and Elle Fanning donated their salaries to women’s causes. The story is about college kids, but it includes a middle aged man, Jude Law, who has affairs with much younger women, even a 15 year old. Amazon may or may not release the movie. He must feel abandoned. It’s sad, we do love Woody’s movies, but he may have trouble casting his next film – if there is another. whatever but he will die like anybody else…………. Woody the pervert likes them young! you couldn’t pay me to see this pervert’s movies. he should be in prison. Always look forward to a new movie from Woody. Let’s hope this is never shown and that he leaves the film industry now and forever. Soon Yi looks like a grandma.